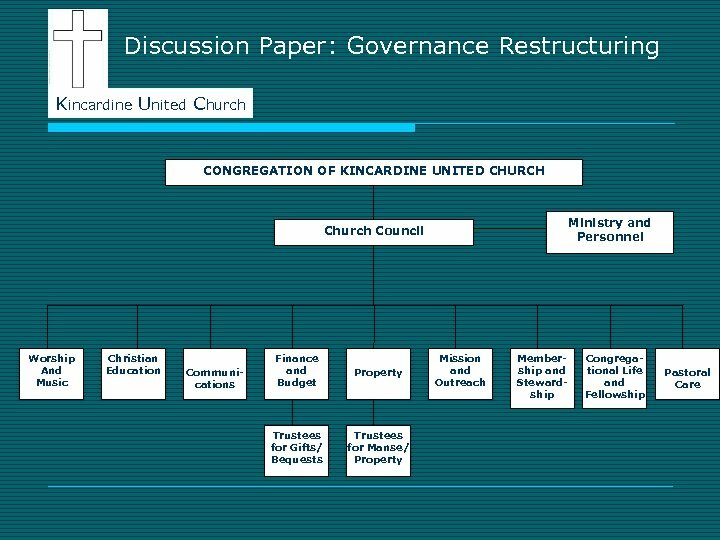 Discussion Paper: Governance Restructuring Kincardine United Church Current Governance Structure • In 2004, KUC adopted a Council model of governance. • In 2009, Council initiated a review of the mission statement for KUC. • While undertaking its visioning and discernment around the mission statement, Council decided to review the governance structure as well. 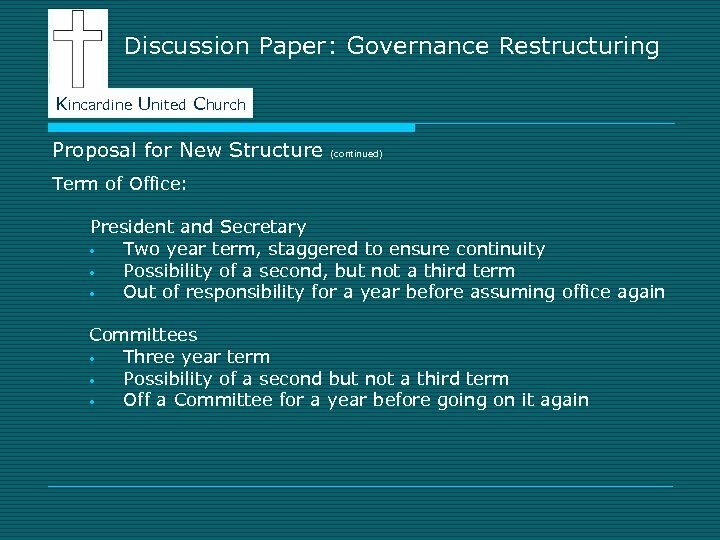 • Council set up a Task Group to prepare a discussion paper on governance restructuring. Discussion Paper: Governance Restructuring Kincardine United Church Current Structure (continued) Most Committees meet regularly, often monthly, so that potentially, including Council, there could be 11 different meetings each month with the average time for each meeting being 2 hours. Many Committee members also spend hours each month carrying out the tasks planned by their Committees vary in size from 2 to 9 members. Some members sit on more than one committee and 1 from each Committee sits on Council The Ministers are required to participate at Council and are ex officio on all other Committees except M&P Terms are for three years, renewable once. Discussion Paper: Governance Restructuring Kincardine United Church Problems with Current Structure • • Very time-consuming, bureaucratic, and hierarchical Focuses more energy on talking than on doing Terms not strictly applied; tendency for the same people to hold office over an extended period of time, causing burnout Difficult to attract new volunteers to serve on Council or Committees Requires Ministry staff time that might better be spent on core ministerial duties Expressed desire of many to do specific task-oriented work rather than traditional committee work Does not recognize new task groups that have developed such as the Sacrament Guild, the House System, Bee for Bears, etc. Discussion Paper: Governance Restructuring Kincardine United Church Proposal for a New Structure: The whole congregation is key to the new structure. The members of Council and the Committees would continue to be elected from the congregation at a congregational meeting. Council and the Committees are accountable to the congregation. The Council and Committees would provide an annual report to the congregation for approval. The congregation would continue to approve the budget, the financial statements and any hiring of Ministry Personnel. Discussion Paper: Governance Restructuring Kincardine United Church Proposal for New Structure (continued) Committees: 7 members each, including the responsible minister(s). These members are responsible for coordinating the Committee’s areas of work, ensuring Manual requirements are met and nurturing small groups. The individual members of each Committee have a collective responsibility for all of the Committee’s areas of work. Committees will consist of people who enjoy planning, reflecting, and organizing. Discussion Paper: Governance Restructuring Kincardine United Church Proposal for a New Structure (continued) • Kincardine United Church Trustees are constituted under the Manual and are responsible to the United Church and Kincardine United Church for fulfilling their Manual obligations. The Trustees exist as a small group will work through the Administration Committee for purposes of budget and nominations. Discussion Paper: Governance Restructuring Kincardine United Church Proposal for New Structure (continued) Small Groups: These are task-oriented groups which could meet regularly or ‘as needed’. These groups are for the ‘doers’ who prefer specific tasks. Participation is unlimited and based on personal interest. 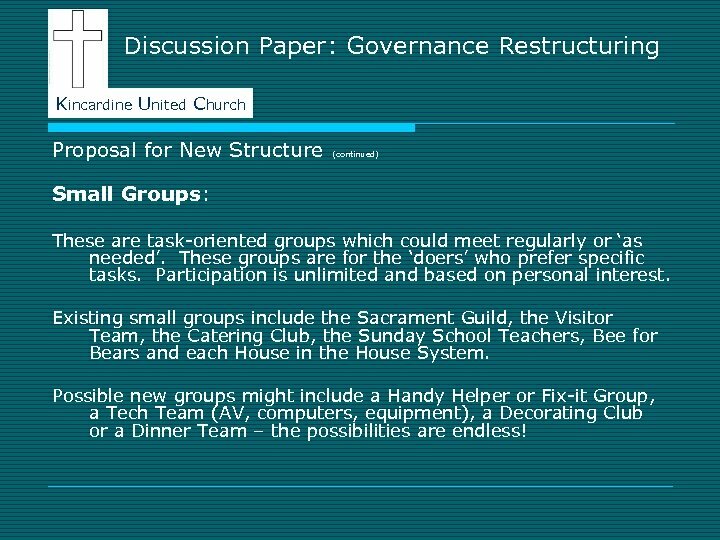 Existing small groups include the Sacrament Guild, the Visitor Team, the Catering Club, the Sunday School Teachers, Bee for Bears and each House in the House System. Possible new groups might include a Handy Helper or Fix-it Group, a Tech Team (AV, computers, equipment), a Decorating Club or a Dinner Team – the possibilities are endless! Discussion Paper: Governance Restructuring Kincardine United Church Proposal for New Structure (continued) Town Hall Meetings • 2 or 3 town hall style congregational meetings per year to involve the whole congregation in the process of discernment and decision-making • Each person has gifts and talents, whatever the level or nature of her/his contribution to our faith community • We will empower one another, by listening, to achieve understanding, and, by respecting, to achieve cooperation. • Many people involved in discussion increases awareness, opportunity and energy. Discussion Paper: Governance Restructuring Kincardine United Church This is a vision of shared responsibility and shared authority. Term limits will encourage continuity, energy and new viewpoints Smaller decision-making groups develop trust, open lines of communication, improve capacity and build community. 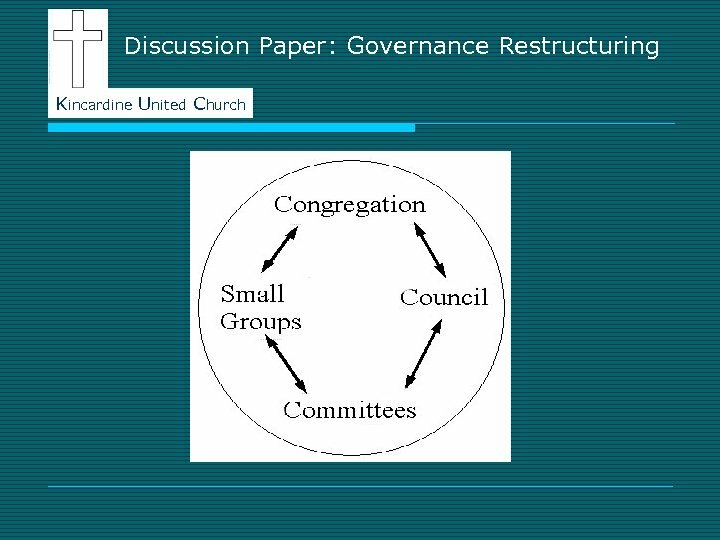 Discussion Paper: Governance Restructuring Kincardine United Church HOW WOULD IT ACTUALLY WORK? Example: The Program Committee • Responsible for worship, Christian education, communications and the house system • The existing Committees for these four areas would no longer exist. • The Program Committee would coordinate and nurture all the small groups performing activities in these areas, would consult with them on budget requirements, would monitor spending, would communicate their concerns to the Council and would communicate to them policy and/or practice decisions made by the Program Committee and Council. Discussion Paper: Governance Restructuring Kincardine United Church Small Groups Related to the Program Committee: • • Worship: The Choir, the Junior Choir, KUCIE, the House of the month, the Sacrament Guild, the Drama Group, the Dance Group, the Nursery, Baptism Group, Coordinating Team for supply ministers and organists, guest musicians, etc. Christian Education: Sunday School Teachers, Confirmation Classes, Library Group, Adult Study Groups, Bible Study Groups, Prayer Groups, Coordinating Team for seasonal children’s activities, drama group, etc. Communications: Audio-Visual Services Group (also arranges cable TV), the Cornerstone Group, the Website Group, the Annual Report Team, Technology Team, etc. House System: House Coordination/Orientation, monthly House Teams, the Tag Team, etc. 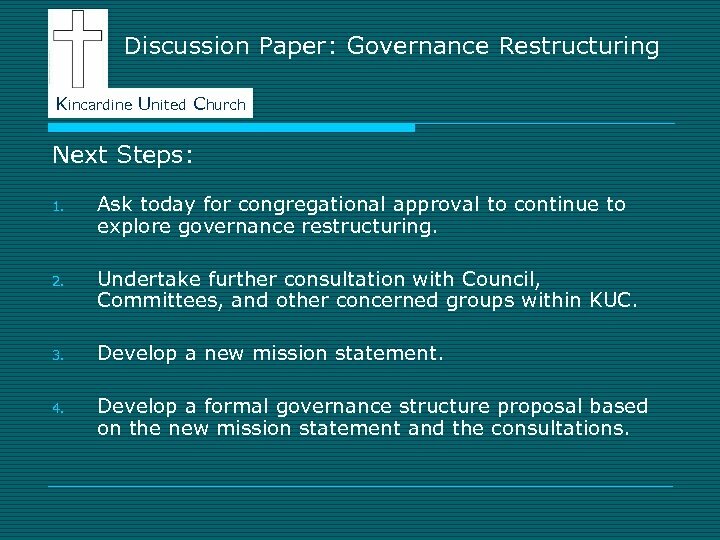 Discussion Paper: Governance Restructuring Kincardine United Church Next Steps: 1. Ask today for congregational approval to continue to explore governance restructuring. 2. Undertake further consultation with Council, Committees, and other concerned groups within KUC. 3. Develop a new mission statement. 4. Develop a formal governance structure proposal based on the new mission statement and the consultations. Discussion Paper: Governance Restructuring Kincardine United Church Next Steps (continued) 5. Present a revised mission statement and a formal proposal for governance restructuring to a congregational meeting called for that purpose. 6. 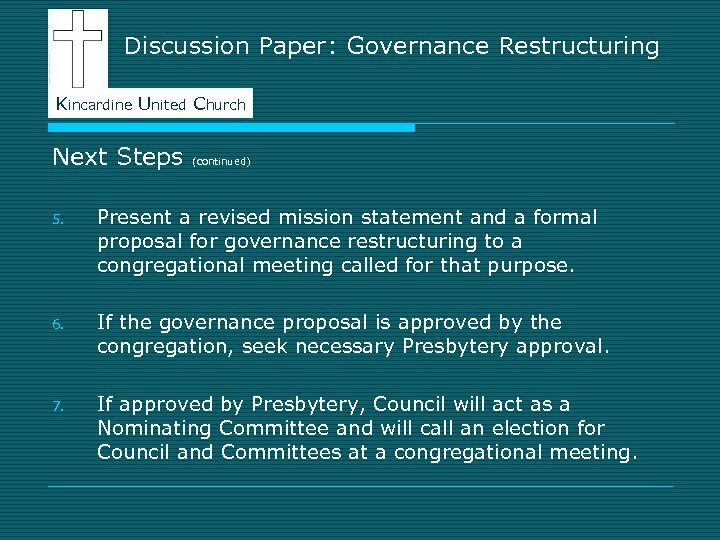 If the governance proposal is approved by the congregation, seek necessary Presbytery approval. 7. If approved by Presbytery, Council will act as a Nominating Committee and will call an election for Council and Committees at a congregational meeting. 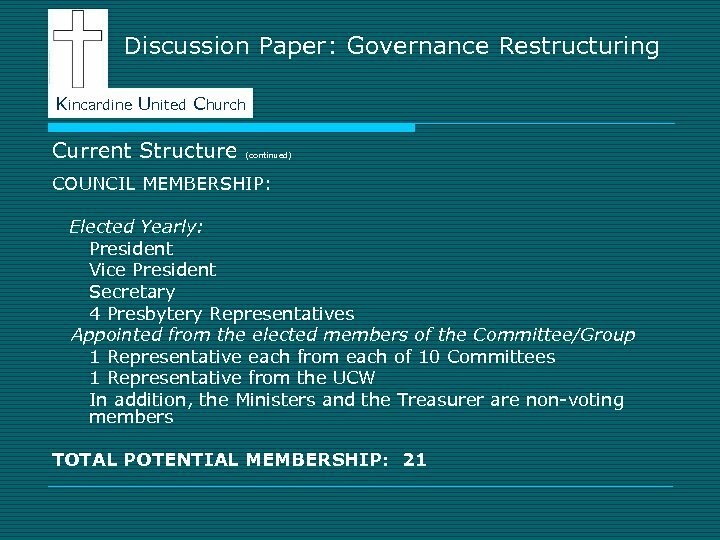 Discussion Paper: Governance Restructuring Kincardine United Church MOTIONS FOR DECISION ARISING OUT OF THE COMMITTEE OF THE WHOLE: 1. 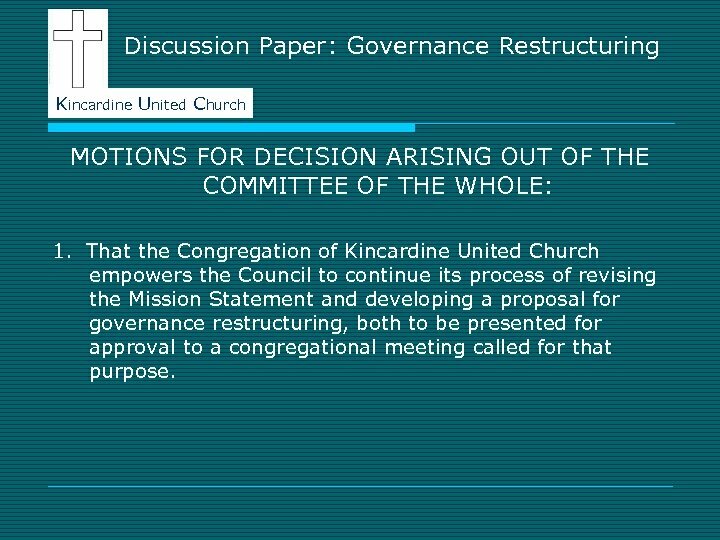 That the Congregation of Kincardine United Church empowers the Council to continue its process of revising the Mission Statement and developing a proposal for governance restructuring, both to be presented for approval to a congregational meeting called for that purpose. 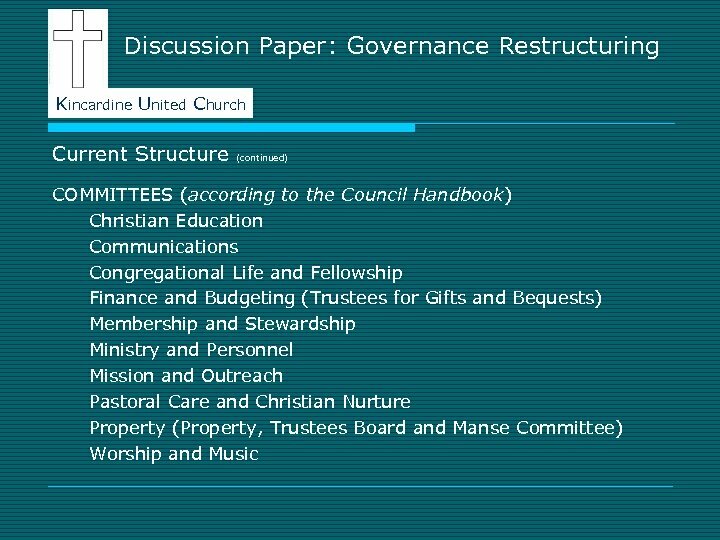 Discussion Paper: Governance Restructuring Kincardine United Church MOTIONS (CONTINUED) 2. That the Congregation of Kincardine United Church approves the Behavioural Covenant presented by Council and agrees to its being posted and used in covenanting liturgies. Protected Area Governance Vitalii Fylenko Senior lector V.